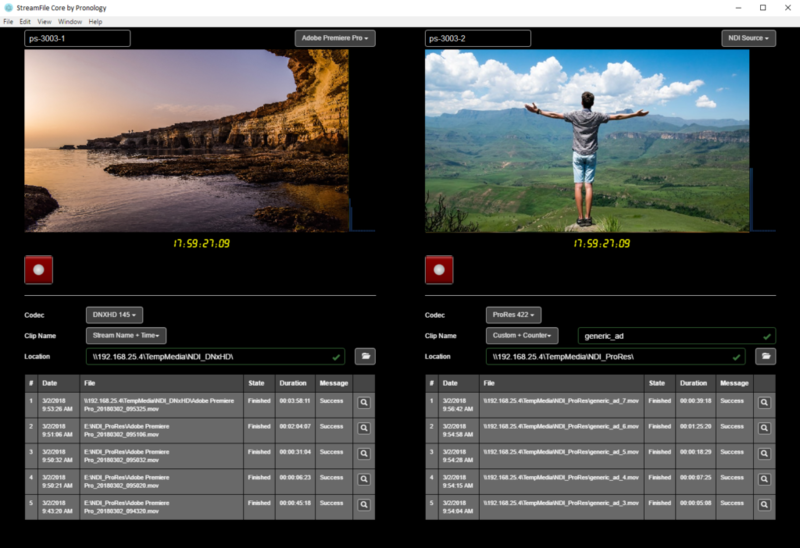 Pronology’s StreamFile Core is a cross platform standalone application that allows for encoding of the evolving IP standards such as Aspen, NDI, NMI, SMPTE 2022 and SMPTE 2110. It facilitates their distribution as popular file-based codecs such as ProRes, DNX, XDCam and others. StreamFile Core, built upon the same core that powers our award-winning mRes encoder, bridges the gap between new IP-based video technology and legacy file-based workflows. This application will enable facilities and studios moving to an IP-based platform to utilize their existing NLE, graphics, and digital system infrastructures. The application is agnostic to frame rate and resolution. This architecture allows for a future-proof way to utilize evolving IP video standards without any hardware upgrades to existing systems. StreamFile Core is an easy-to-use tool that builds upon Pronology’s reputation of creating simple and understandable user interfaces. It allows for analysis and validation of hardware to insure compatibility, simple setup and optimal performance. This affordable tool is designed to be run on any system with minimal setup allowing companies of any size to enter the IP technology landscape, without a large investment. Compatibility, low cost, reliability and ease of use make Pronology’s StreamFile Core a must have for any company interested in integrating with emerging IP technologies.